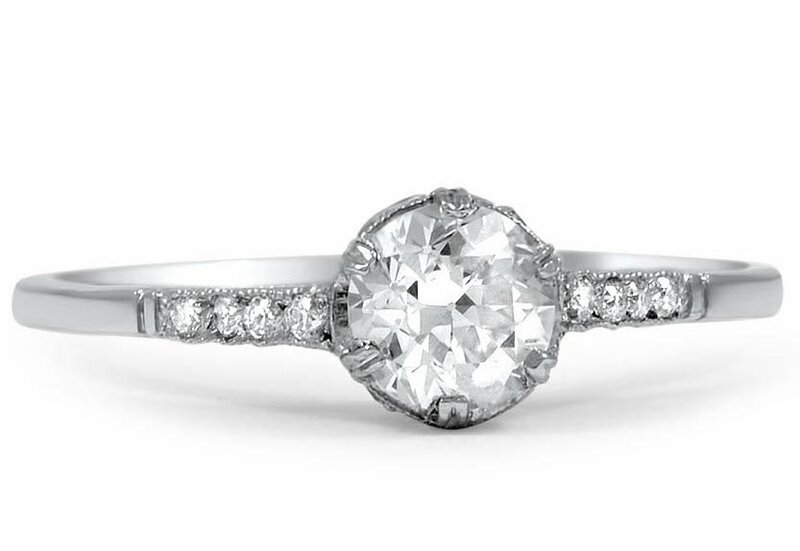 It seems like more and more couples are falling for vintage engagement rings. These rings from centuries past boast unique designs, sublime craftsmanship, and a sense of romantic history. Antique rings are also a very eco-friendly choice since they require no new mining. 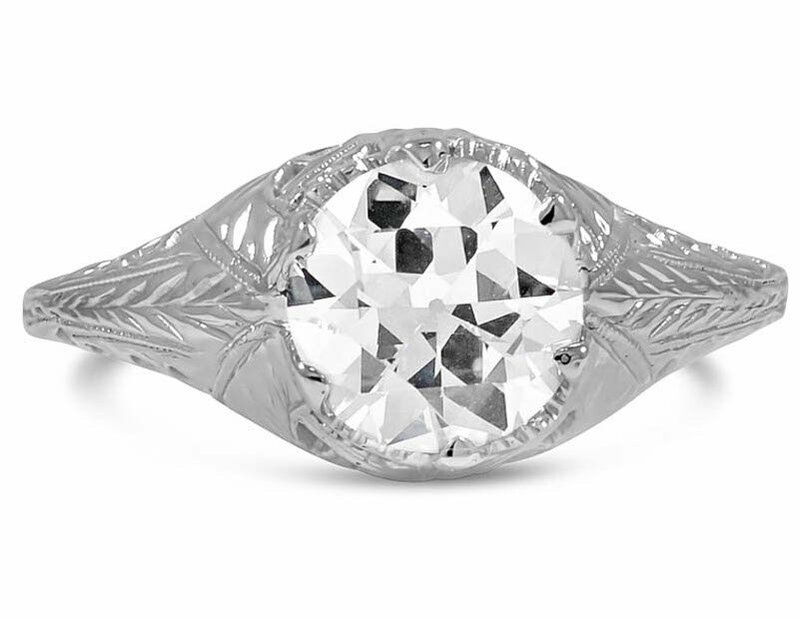 Vintage diamond rings often showcase antique diamond cuts that may be unfamiliar to today’s couples. The most popular diamond cut in new rings, the super-sparkly round brilliant cut, is a relatively recent development–it was invented in 1919 and perfected in the 1950s. Antique cuts lack some of the intense sparkle of the round brilliant cut and other modern cuts, but they offer a warmth and lustrous shimmer, and some people prefer them for their subtlety and heirloom feel. Often cut by hand, antique cuts reveal a personal touch. If you adore vintage diamond rings, read on to learn more about antique diamond cuts and see some beautiful examples of each. The rose cut resembles a rosebud, with a flat bottom and dome-shaped crown that rises gently to a single apex, with between three and twenty-four facets. This cut dates to the 1500s and remained common during the Georgian and the Victorian eras. Rather than focusing on the diamond’s internal fire and brilliance, the rose cut highlights a diamond’s surface luster. Because of this rose cut diamonds give off a warm, romantic shimmer. Considered an early form of today’s cushion cut, old mine cut diamonds possess a soft square girdle with gently rounded corners. The old mine cut dates to the 1700s and was widely used during the Georgian and Victorian eras. This cut was invented before jewelers truly understood how light moves through diamonds, so old mine cuts involved faceting just around the natural edges of the diamond. Although that results in less dazzling sparkle than modern cuts achieve, old mine cuts reflect that natural shape of the diamond crystal. The old European cut typically features 58 facets and a circular shape, and was a predecessor to today’s modern round brilliant cut. 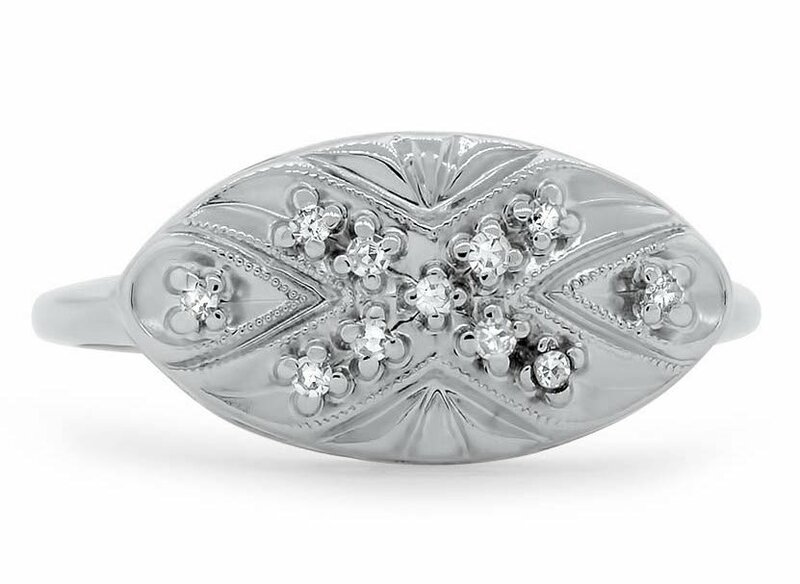 The old European cut was first seen in the 1800s and was used quite often in Victorian engagement rings, Edwardian designs, and Art Nouveau styles. This cut has been through many variations, reflecting jewelers’ evolving understanding of diamonds and their attempts to best emphasize the gemstone’s beauty. This extremely old cut dates all the way to the 1300s, and features a large table (the top, flat part of the diamond) and an octagonal girdle (the edge of the diamond at its widest point). 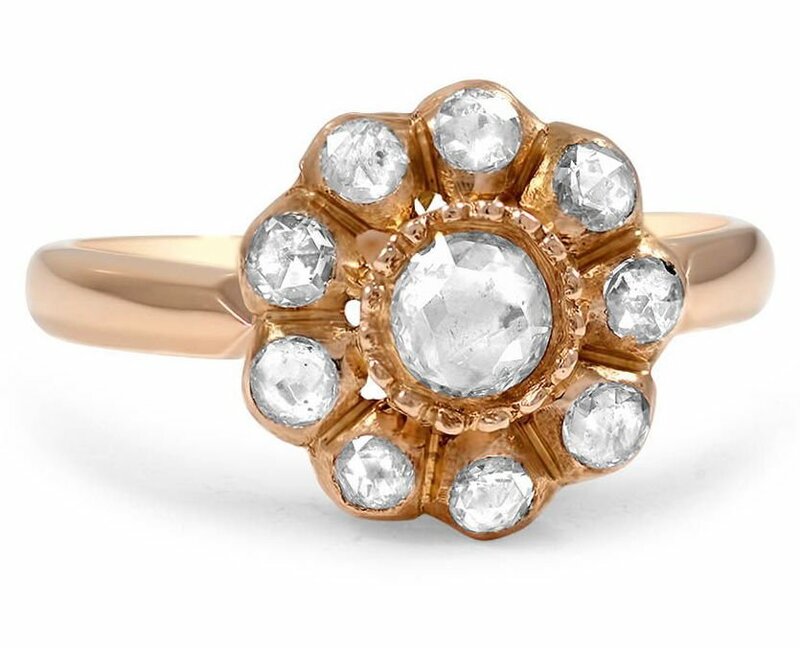 Single cut diamonds usually feature eighteen facets, and you’ll often see small single cut diamonds accenting a center gemstone in antique rings from the early twentieth century when jewelers still lacked the ability to create many facets in tiny gems. What do you think of these antique diamond cuts? 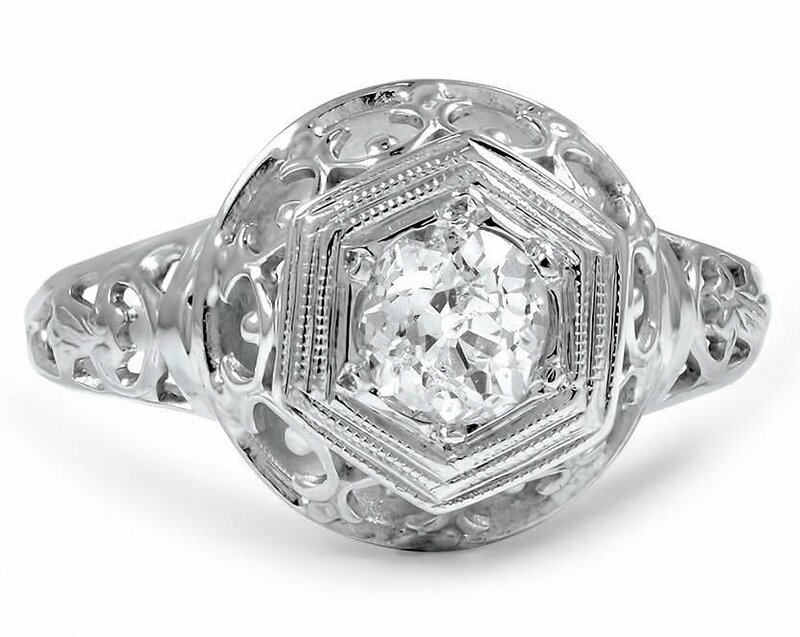 Do you own (or do you hope to own) an antique diamond ring? Let us know on Facebook or Twitter, or in the comments section!